A Pub Can or Bottle Wrap is a must for any man who enjoys relaxing with great company and sipping on a cold one. Cold Beer and good times will always be available at your home when everyone has their own Personalized Can Wrap. 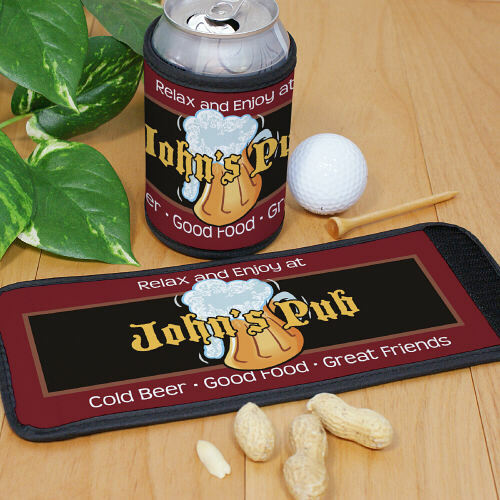 This Pub Can Wrap Cooler makes a great gift idea for Father’s Day, Birthdays or just because. i asked that is read tiki bar bar. i received tiki bar bar pub. the description did not say pub would be in the line. Our Personalized Can Wrap is a great gift idea for anyone who enjoys good company and a cold one. Any Can Wrap that you choose also makes a unique Personalized Father’s Day Gift Idea. Not only is this Can Wrap great for Dad, Grandpa, Uncles or Brothers, it is also great for anyone who has a bar our man cave at their home. Be sure to also take a look at our Beer Pub Welcome Wall Sign to add that finishing touch to your lounging area.